This brilliant idea began where many brilliant ideas begin – the liquor store. Unlike some of those other ideas, this one was actually brilliant. We were on a family beer shopping trip (that’s totally a thing), and I was helping my mom browse the rather expansive selection in the cooler. Going over the types of beer that she enjoys, we settled on the Dogfish Head 60 Minute IPA for its hoppy bite. As I walked around the store checking out new brews, I kept looking down at the basket and pondering the flavor profile of the bounty within. Beer got me thinking about food, which got me thinking about burgers, which got me thinking about mustard (a natural thought progression). 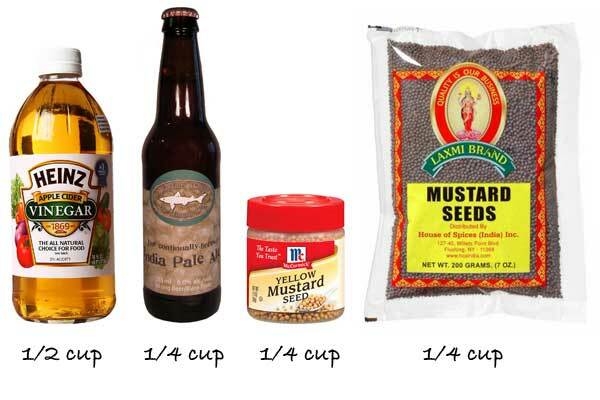 Given my love of foodception, I decided that I would make the mustard with the beer. 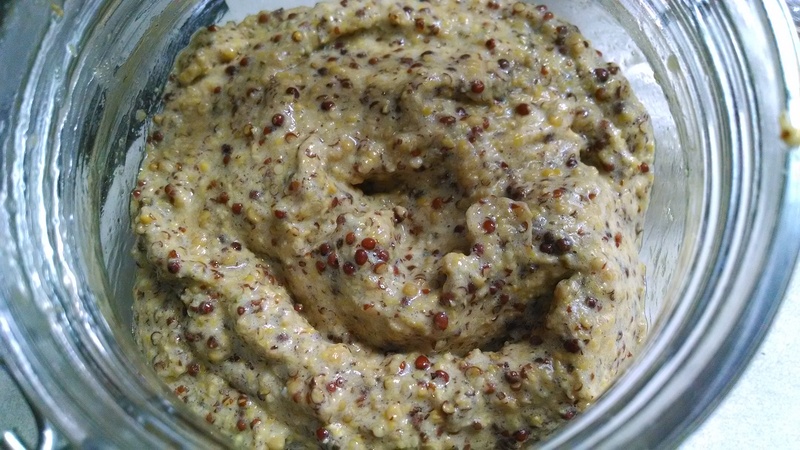 Now, before you start thinking that homemade mustard is beyond your culinary grasp, let me reassure you that there are really only 4 basic ingredients. The only “specialty” item in the bunch is the brown mustard seeds, but I’ve never found them difficult to locate. The easiest place to find them in the grocery store is with the Indian foods, since it’s a common ingredient in Indian cooking. If your grocery store doesn’t have an international aisle, you can order them online fairly cheaply. You can also substitute pretty much any liquid for the beer, although it’s probably best to stick with something slightly acidic like apple cider, orange juice, or white wine. Mix the ingredients in the amounts shown above in a glass or ceramic bowl. Cover the bowl with plastic wrap and leave it on the counter at room temperature for up to 2 days. The seeds should be soft enough to blend after 12 hours, but I like to give them a little extra stewing time. If you’re a klutz like I am, you may want to leave the bowl on a table rather than the counter. The final step is blending your seeds into mustard. You’ll want to add a pinch of salt and 1 or 2 tsp of something sweet. I went with brown sugar, but you can also use honey, maple syrup or agave. If you’re feeling adventurous, you can also add other herbs or spices to customize the mustard in infinite ways. It’s important to use a food processor that has a powerful enough motor to break down the seeds. I’m in love with my Ninja (hence the slightly deceptive post title) because in addition to packing a punch it also has 4 blades instead of the traditional 2. How long you blend it really comes down to personal preference – you’ll want to keep some of the seeds intact while making sure enough are blended to turn it into a spread. I find the best method is a repeated process of pulsing and then checking on the mustard until it’s the consistency I like. After you’ve pulverized your mustard, you should transfer it to a glass container with a firm lid. Leave it out at room temperature for another day to fully mature and then store it in the fridge. It should stay fresh for about 3 months, but I doubt it will last that long. And just in case you meandered over here expecting the explosive combination of cooking and ninjas, I found you this video. I was literally just talking about making mustard tonight…! Thanks for nudging me further down the line.